Smarty CRM Contact Includes all details about your Contacts. Contact details are not just names and numbers. Smarty CRM contact includes all manner of details about an individual or an organisation from their social media links to their interaction history with your organisation. 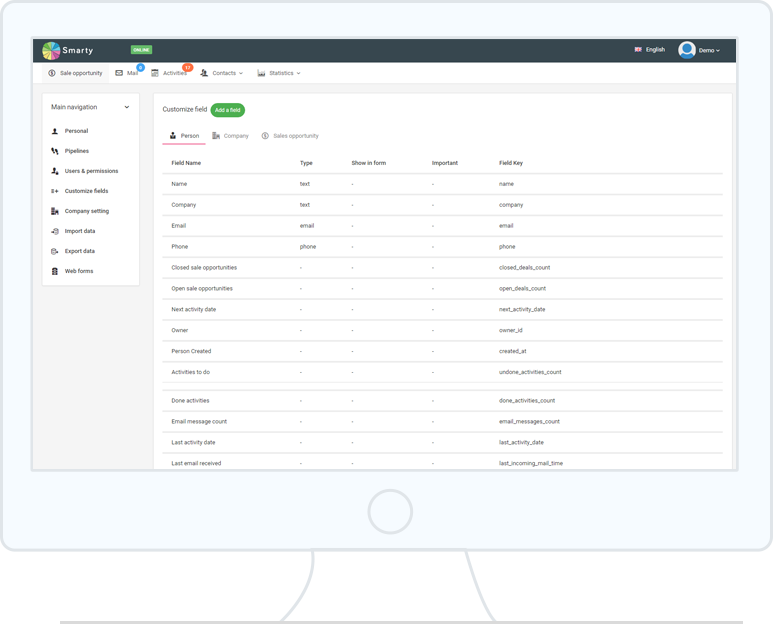 Smarty CRM will also show you how your different contacts link together, wich will allow you to easily form networks of clients or customers to help your sales process. What’s more, when viewing a contact details you will be able to recall all previous email and phone interactions so you can pick up exactly where you or your colleague left off. Fragmented customer information becomes a holistic and useful sales tool. 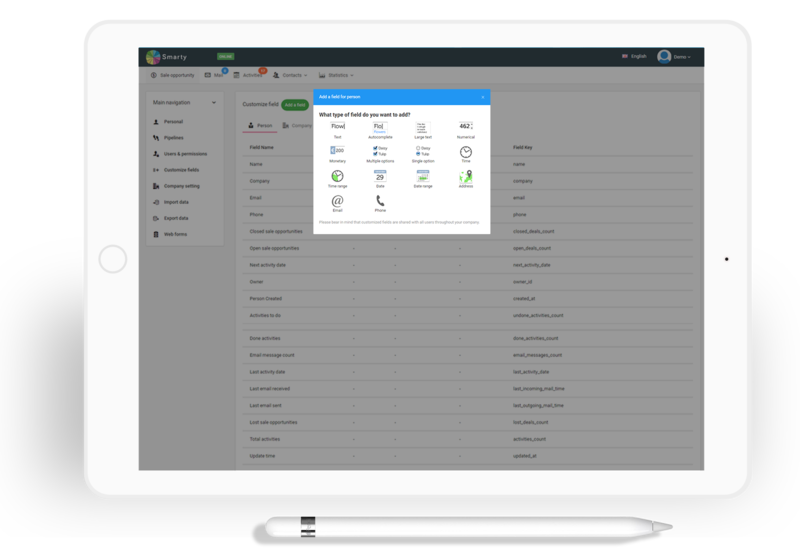 Create comprehensively customisable contacts within Smarty CRM. Include all relevant information for an individual or a business contact, including everything from details of their social media presence to the history of the interactions they have had with your business. Establish the ways in which different contacts are linked, letting you generate interconnected networks of customers and clients that can be used to make your sales efforts far more impactful and well optimised. Pick up where you left off in your communications with a contact. whether you previously engaged via email or over the phone. This is great for colleague collaboration and customer relationship management purposes alike. Eliminate any fragmentation in the way you collect customer information and adopt a holistic approach to sales, marketing and follow-up service provision. Many sales software’s make people seem like numbers and targets. Smarty CRM software understands that people and relationships are a lot more complicated than that. 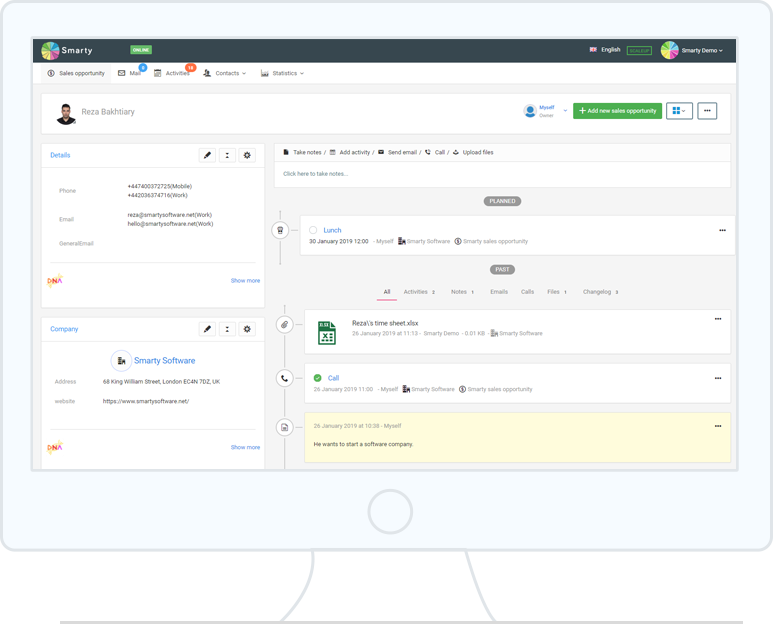 Smarty CRM holds a variety of information, from social media accounts to standard contact details, from past email interactions to call recordings and from organisation type to client responsiveness. Getting to know a client fully is the best way to get on the same level as them and increase your chances of making a sale or signing someone up to your service. While one of your team members maybe be able to know this information about up to 20 clients, Smarty can do it for thousands. What’s more centralising this data means that you can always pick up where someone else has left off. Smarty CRM will also be able to hold all of your client’s social media details. This expands the plethora of ways in which leads can be contacted but also gets you more in tune with who they are and what they stand for. With a client’s social media accounts just one click away it will be easy to get to know a bit more about them before or after a conversation, increasing the chance a lead will be closed.